Last week Oleg Taranov at Alpha Marine told me to expect a price reduction for his central listing, the 37.3m motor yacht Millennium and today he advises that she's now dropped by €1 million. 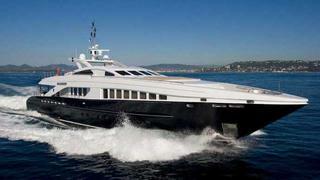 Millennium was delivered by Heesen in November 2006 and has very low engine hours due to limited usage since May 2007. ABS classed, this superyacht sleeps 12 guests in six staterooms and cruises at 24 knots, with a 2,400 nautical mile range at 12 knots. Oleg goes on to say, "She has always been a private yacht, owned and maintained to the very highest standards." Millennium is now asking €8.9 million.